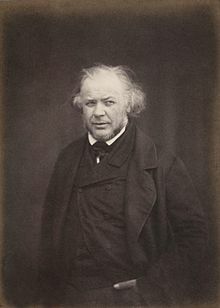 Daumier was born in Marseille to Jean-Baptiste Louis Daumier and Cécile Catherine Philippe. His father Jean-Baptiste was a glazier whose literary aspirations led him to move to Paris in 1814, seeking to be published as a poet. In 1816, the young Daumier and his mother followed Jean-Baptiste to Paris. Daumier showed in his youth an irresistible inclination towards the artistic profession, which his father vainly tried to check by placing him first with a huissier, for whom he was employed as an errand boy, and later, with a bookseller. In 1822, he became protégé to Alexandre Lenoir, a friend of Daumier's father who was an artist and archaeologist. The following year Daumier entered the Académie Suisse. He also worked for a lithographer and publisher named Belliard, and made his first attempts at lithography. During the reign of Louis Philippe, Charles Philipon launched the comic journal, La Caricature. Daumier joined its staff, which included such powerful artists as Devéria, Raffet and Grandville, and started upon his pictorial campaign of satire, targeting the foibles of the bourgeoisie, the corruption of the law and the incompetence of a blundering government. 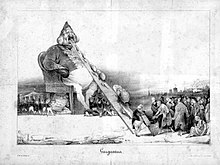 His caricature of the king as Gargantua led to Daumier's imprisonment for six months at Ste Pelagie in 1832. Soon after, the publication of La Caricature was discontinued, but Philipon provided a new field for Daumier's activity when he founded the Le Charivari. Daumier was not only a prolific lithographer, draftsman and painter, but he also produced a notable number of sculptures in unbaked clay. In order to save these rare specimens from destruction, some of these busts were reproduced first in plaster. Bronze sculptures were posthumously produced from the plaster. The major 20th-century foundries were F. Barbedienne Barbedienne, Rudier [fr], Siot-Decauville [fr] and Foundry Valsuani [fr]. There can be no doubt about the authenticity of Daumier's Ratapoil and his Emigrants. The self-portrait in bronze as well as the bust of Louis XIV have been frequently debated over the last 100 years, but the general tenor is to accept them as originals by Daumier. Daumier made several paintings of The Heavy Burden. The woman and her child look like they are being pushed by the wind, and Daumier used this as a metaphor of the greater forces they were actually fighting against. The greater forces that Daumier wanted to show that they were trying to fight were the Revolution, the government, and poverty. The woman and her child in the painting are outlined by a very dark shadow. In addition to his prodigious activity in the field of caricature—the list of Daumier's lithographed plates compiled in 1904 numbers no fewer than 3,958—he also painted. Except for the searching truthfulness of his vision and the powerful directness of his brushwork, it would be difficult to recognize the creator of Robert Macaire, of Les Bas bleus, Les Bohémiens de Paris, and the Masques, in the paintings of Christ and His Apostles (Rijksmuseum in Amsterdam), or in his Good Samaritan, Don Quixote and Sancho Panza, Christ Mocked, or even in the sketches in the Ionides Collection at South Kensington. There is a room-full of caricatures in the museum Am Römerholz in Winterthur. Don Quixote and Sancho Panza was found as part of the 2012 Munich Art Hoard. As a painter, Daumier was one of the pioneers of realistic subjects, which he treated with a point of view critical of class distinctions. His paintings did not meet with success until 1878, a year before his death, when Paul Durand-Ruel collected his works for exhibition at his galleries and demonstrated the range of the talent of the man who has been called the "Michelangelo of caricature". At the time of the exhibition, Daumier was blind and living in a cottage at Valmondois, which Corot placed at his disposal. It was there that he died. Daumier's works are found in many of the world's leading art museums, including the Louvre, the Metropolitan Museum of Art and the Rijksmuseum. He is celebrated for a range of works, including a large number of paintings (500) and drawings (1000) some of them depicting the life of Don Quijote, a theme that fascinated him for the last part of his life. ^ "Honoré Daumier: A Finger on the Pulse". Hammer.ucla.edu. Archived from the original on 2013-01-27. Retrieved 2013-02-23. ^ "Revolutionary Dreams: Investigating French art". Archived from the original on 2015-07-21. Retrieved 2014-12-08. This article incorporates text from a publication now in the public domain: Chisholm, Hugh, ed. (1911). "Daumier, Honoré" . Encyclopædia Britannica. 7 (11th ed.). Cambridge University Press. p. 849.